The initial church was a small wooden structure, thirty by seventy feet, located on Edgemont Avenue between Baltimore Pike and Broadway Avenue. A new stone church in Normandy Gothic style was built on the corner of Broadway Avenue and Holly Street. The blessing of the new church was celebrated on January 16, 1938. The Archdiocese of Philadelphia granted permission in 1952 for the construction of Sacred Heart School. Sacred Heart School opened for classes on September 9, 1953 with classes held in two locations, the basement of the church and in the old church which was then used as a social center. On Thanksgiving Day, November 26, 1953, the new school building was blessed. In April of 1962 a new convent was dedicated. Until 1964 Sacred Heart Parish was strictly a national parish for Polish people living within its boundaries. With the canonical establishment of territorial boundaries, September 1, 1964, Sacred Heart Parish was no longer restricted to families of Polish origin. The parish now embraced into its fold people of all ethnic backgrounds who lived within the parish territory. A new parish Social Center located at the corner of Marple and Berkley Avenues was dedicated in December, 1968. The interior of the church was renovated from the Spring of 1974 until Easter of 1975. Due to an adverse financial climate and rapidly declining enrollment, the parish school was forced to close in June of 1986. 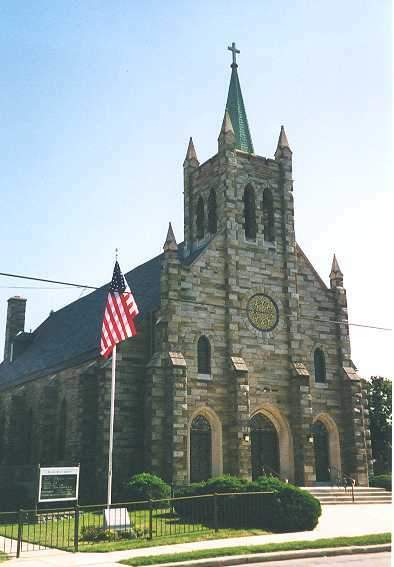 St. Hedwig’s Church in Chester, PA was canonically suppressed on June 20, 1993 and linked with Sacred Heart Parish as a worship site on June 24, 1994. Sacred Heart Parish currently enjoys the status of canonically being both a territorial and personal parish. Extensive renovations to the sanctuary of Sacred Heart Church were carried out in the summer of 2000. In June 2008 Sacred Heart Parish closed their Nursery, Pre-K, and Kindergarten. The School Buiding and the Social Hall were sold in 2011/2012. The Church was renovated with painting, adding color to the Stations of the Cross, new padding for kneelers and new carpeting in May/June 2012. The parish continues to serve the people of Delaware County and the Church of Philadelphia under the patronage of the Sacred Heart of Jesus.